Given the popular answers of wanting to promote world peace and help the children, it seems pretty unlikely to think that near the end of a beauty pageant, when the host asks a contestant about the woman's goals that she would suggest a future of racing motorbikes onto speeding trains, hanging off the side of a van or diving onto a moving convertible. But then again, Michelle Yeoh has never been one to do what's expected. A former Miss Malaysia, the elegant beauty who had been trained in classical ballet since she was four years old rebounded from a back injury to pursue a baccalaureate degree in England that offered a fall-back plan of drama. And despite her doctor's advice that she should give up ballet and not doing anything extraordinarily physical, Yeoh proved everyone-- including Mr. Jackie Chan-- that she could lay the smack down with the best of them. In a twenty-three minute interview called "Dancing With Death," that appears on the second disc of Dragon Dynasty's stunning release of Supercop, Yeoh reveals that Chan-- the first man she ever worked with in Hong Kong who also introduced her to her husband-- had always stated that "women should never do action, period." However, as an afterthought, soon he rephrased his belief with the addition of, "except for Michelle." 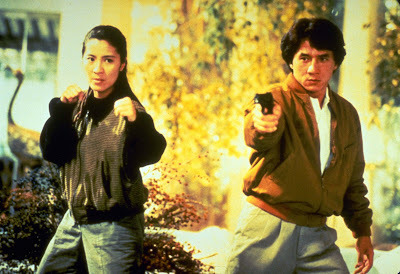 Despite a lack of rigorous martial arts background, Yeoh made up for what she lacked in experience with athletic dedication, working day in and day out with the stunt team, the director Stanley Tong (a former stunt choreographer and stuntman himself) so that she could become "one of the boys." 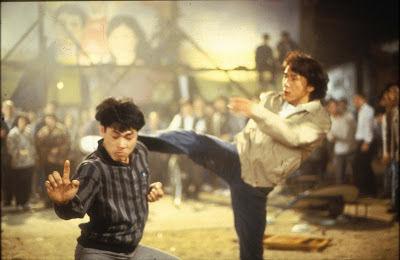 One of Chan's most enduring and popular films that predicted his eventual super-stardom in America when his crossover hit Rumble in the Bronx (also directed by Tong) was released here in the states, Supercop a.k.a. Police Story 3 finds Chan reprising his role as a quick thinking and daring Hong Kong police officer who goes undercover with Yeoh's more "by the book" federal agent to bring down an organized crime syndicate specializing in the illegal drug trade. And indeed, the film is extremely indicative of what the actor refers to as the "Chan style," that blends the humorous improvisation and physicality of Chan's silent film idols like Keaton, Lloyd, and Chaplin with a voracious appetite to top each and every stunt recently completed. In doing so, Supercop makes for both extraordinary and highly nerve-wracking viewing as we cringe realizing that every time they hit the ground, set themselves on fire, dive, or jump on the rung of a soft ladder attached to a helicopter, we're shocked that we're actually seeing Chan and Yeoh in action for real. Lamenting the lack of technology available at the time in the Hong Kong filmmaking industry in a candid twenty minute interview called "Flying High," Jackie Chan discusses the challenges of shooting on location, conquering his fear, and the way that things have changed in his homeland for movie productions in the last few decades. 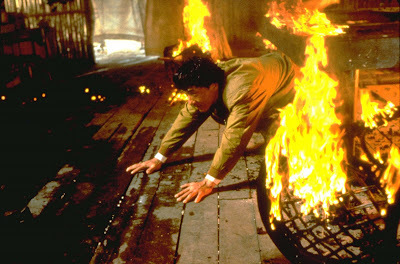 Although they made excellent use of wires, part of the sheer majestic beauty (not to mention the creative insanity) of Hong Kong cinema is that there were no blue screens, green screens, CGI effects, or stunt doubles for the leads which makes their audacious films tremendously inspiring and visceral illustrations of just what the human body is capable of doing. However, despite this-- brain still triumphs over brawn as both actors separately admit that while they're proud they did what they did in the film, they're not sure they'd do it again because if they think too much, the adrenaline leaves, reason takes over and there's no way they'd take part in some of the film's most memorable sequences including that legendary breakneck chase through the streets involving cars, trains, and one extraordinary helicopter. Featuring some of the most breathtaking action sequences that still hold up impressively to this day putting our now modern overly CGI American movies to shame seventeen years after its release (both in Hong Kong and a much lampooned American edit that Chan shares his intense distaste for in the interview). And while some of the film stock still appears a bit grainy, the picture quality is far superior than it was previously, filling 16x9 televisions with eye-popping clarity and sound. The thirty-third release from Dragon Dynasty that's a must for fans of the charismatic, comedic and confident Chan who offers a solid understanding and opinion of knowing what a "Jackie Chan movie is" and what audiences dislike that also boasts interviews with Tong, a feature commentary by Hong Kong cinema expert Bey Logan and Chan's bodyguard, training partner, and co-star Ken Lo. Yet, more than anything, as a woman and one who was completely mesmerized by Yeoh's humility and candor, this time around I found myself equally if not more dazzled by the first lady of Hong Kong action-- Ms. Michelle Yeoh --as she flies through the air, high kicks into action, and manages to meet Chan's energy fist for fist, kick for kick, and dive for dive.